Getting to know the MashMeTV Team (I) – Edu Casanova | MashMeTV, the blog! Share content like never before! Today we start a chain of posts in order to introduce you the team behind MashMeTV. Our first interview will be to Edu Casanova, our jedi coder! Be careful this guy does not bite his tongue. Enjoy! As a child, I used to gather every broken gadget and dismantle it to see how they were inside. As a school student, I loved maths, physics and chemistry. I had my first HTML experiments with 12-14 years. I found myself playing like a child in my programming lessons and projects in the university. So I ended up in a investigation group on cutting edge web technologies and meeting Victor, my current captain! – What was on your mind when you decided to join MashMeTV instead of finding a regular job? I don’t like regular things. Regular things are boring and uninspiring. If you take a normal job you will have a moderate earning, with some stability and a fair rate of improving your position. However, Spain is not in it best moment. Work is hard to find, harder to maintain and with not a really brilliant future. And here comes Victor with a proposal for me: joining MashMeTV. It’s risky, fun, challenging, nearly slavery … who could say no? – Tell us, what you do in MashMeTV? As everyone in this team, I have to row as fast as I can. When you are in a small team working on an ambitious project like this you can’t focus in just one area. You become a jack of all trades but also a master of everything. You have to help in the design with your pencil, later you take the pickaxe and begin coding, but you can’t forget the helmet for the testing part. – Where do you see MashMeTV in 2 years? As the reference in social video chat. There are some webs offering similar products as Google Hangouts, So.cl or even MashMeTV clones, following our shadow from far away. But I think we hit the correct spot. Our growing rates suggests people was almost waiting for us. If you add to this a team with a ground breaking motivation and hunger for new challenges, there is no wall to stop us. – What do you do with your life when you’re not working? Wait! Is there anything out there? So, life is not just working and working? Oh my … Hey, just kidding! I can’t say being in MashMe is a work for me. I love coding and creating things from scratch to solve new challenges. When I am not coding or solving the problems of the universe in my head you will probably find me watching a film or listening to some music. I also enjoy testing every video game at my reach. 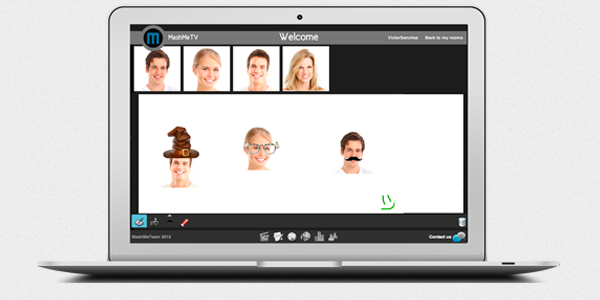 – If you had 2-3 lines to convince every single user in the world to use MashMeTV, What would you say? Borrowing some of Victor’s words: “MashMeTV is like a huge sofa where you can join your friends, mates, family, co-workers and share lots of content as if you were together”. What do you think about Edu? =) Comment below! Jose Donayre Kuan on ¡Estamos creciendo!